We'd been staying at chain hotels/motels throughout most of our trip. For our four night stay in Tucson, I wanted something a bit different. After doing a bunch of Internet research, I decided on Lodge on the Desert. One of the reasons for choosing this hotel over comparative others was the special they were running ... 10 percent savings for each night of a multiple night stay. Since we were staying 4 nights, our room rate was 40% off rack rate, bringing the nightly rate under $100 (before taxes). The location of the hotel was great, conveniently located mid-Tucson, easily accessible to two main east-west roads. We had a huge room with a king sized bed. A sliding glass door opened to a small patio (upstairs rooms opened to a small balcony). We enjoyed the cool mornings and evenings in our room with the sliding door open. The grounds were lovely and the room was very comfortable. There is a small pool but neither of us used it. Two excellent restaurants are within walking distance. One night we went to the Old Pueblo Grill, located about 1 1/2 blocks away. We had an excellent southern New Mexico style dinner. The other restaurant we went to is located on the premises of Lodge on the Desert. The Lodge on the Desert restaurant, like the Old Pueblo Grill, offers both indoor and outdoor dining. We chose to dine outdoors. The menu is very limited and it is not a cheap restaurant. But the meal was excellent with unusual dishes. We headed north to Phoenix where we met up with some old friends. Mark and Myrna used to live in California but moved out to Phoenix several years ago. We met Mark and Myrna on a group cruise organized by our then agent (and now still agent and very good friend) Ellen of Sea4Sail. We drove to their new home and joined them for breakfast. We had a wonderful visit. Next, for a late lunch/early dinner, we met up with Mary Ann who lives in Scottsdale. Mary Ann is also part of this cruise group and it was Mary Ann, through my parents, who introduced us to Ellen. At Mary Ann's suggestion we met at a New York style deli and thoroughly enjoyed both out meal and our time together. Then it was on to an overnight in Prescott Valley, AZ. 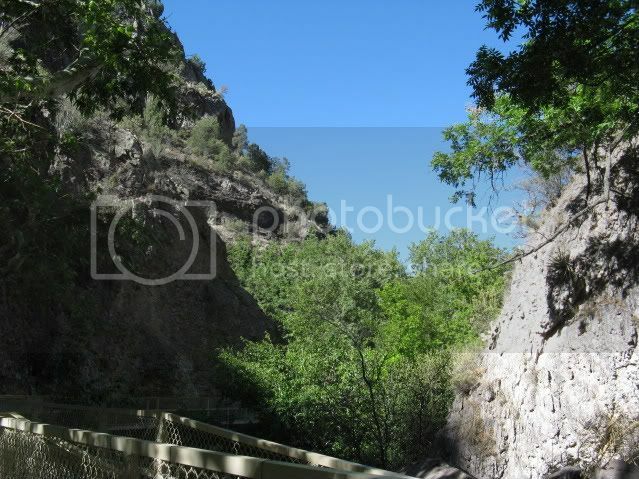 We continued onto Flagstaff driving the Oak Creek Canyon Road, another very scenic area. During our two nights in Flagstaff, we spent one full day doing a scenic drive of Sunset Crater Volcano National Monument and Wupatki National Monument which are located right next to each other. We thoroughly enjoyed our visit and the drive. Next day we were going to be heading to the Grand Canyon. But we had the morning free. So we decided to visit the Lowell Observatory. We were very fortunate to arrive just as a tour was starting and we found it very interesting. Our next stop ... Tuscayan, Arizona ... one mile south of the entrance to Grand Canyon Nation Park. We went off of our planned itinerary (so what else is new?) to do some bird watching. A sidebar in Frommer's Arizona and the Grand Canyon pointed us to Ramsey Canyon, south of Sierra Vista, AZ. This area was described as a great place to see hummingbirds. So off we went. The Ramsey Canyon Preserve is part of the Nature Conservancy and there was a $5 entrance fee, good for re-admittance for a week's time. Near the entrance were several hummingbird feeders and benches. We got there late in the afternoon and simply sat and enjoyed watching the birds. We returned the next morning to hike part of the preserve and to continue our bird watching. As a special treat, we got to see a roadrunner cross the approach road both on our way to the canyon and on our return. Pretty neat. 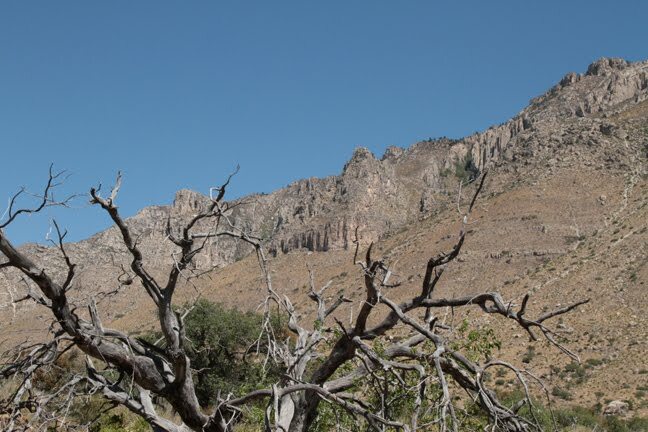 Our second specific bird watching stop in Arizona was Madera Canyon, located south of Tucson. There were lots of different feeders set up, meant for different birds and how they feed. There were hummingbird feeders, of course, ground feeders, suet feeders, hanging feeders and feeding stands. We spotted birds new to both of us and enjoyed our side trips to the canyons. Very near the west part of Saguaro National Park is the Arizona-Sonora Desert Museum. We went to the Saguaro National Park early in the day because we wanted to do some birdwatching. So we ended up at the Desert Museum mid-day. Not a smart move on our part. The Arizona-Sonora Desert Museum is certainly not your typical old, stuffy building, full of old artifacts. It is way more than that. It is also a zoo and a botanical garden. To fully take advantage of our visit we should have visited the web site first and learned about its daily demonstrations. For instance, at 7:30 a.m. there is a Bird Watch Tour (subject to docent availability, of course). Most of the animal demonstrations were in the morning, the cooler part of the day. In the heat of the afternoon, when we were there, some animals could not be seen as they retreated to cool areas of their environment. And those we did see were sleeping out the heat of the day ... which if we were smart, we probably should have been doing. However, in spite of all that, we thoroughly enjoyed our visit there. There is a lot to see and any visitor should allow several hours for a visit ... especially if it is a first visit. The trails and paths are very clearly laid out. There are signs with desert and animal facts and it is easy to do a self-guided tour throughout the grounds. 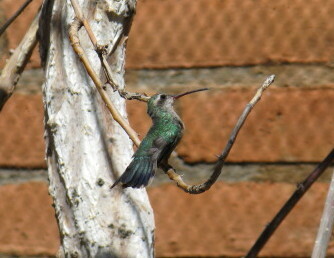 There are two aviaries, one that is just hummingbirds plus several gardens throughout the museum. And, yes, there are some displays that are also inside. Off our planned itinerary, we spent a night in Sierra Vista, AZ. Our purpose was to be able to visit the Ramsey Canyon Preserve. Several phone calls to chain hotels like Hampton and Holiday Inn Express turned up exorbitant rates. Apparently something major was going on at the nearby military base and the hotels had raised their rates accordingly. So after some checking on Tripadvisor, and a phone call later, we booked a room at Gateway Studio Suites for a very reasonable rate. And we were delighted with our accommodation. Huge room. Comfortable. Quiet. And a very nice hot breakfast included. Of course we had to make the obligatory stop at Tombstone. After all, what fan of old western movies can miss this opportunity. We had a feeling it would be commercialized but had no idea just how commercialized. There is nothing to see and do unless you plan on spending money. Head off the main drive one block to the 'preserved' area. The 'Gunfight at the O.K. Corral?' Watch the show for a fee. Visit the old theater? For a fee. Have your photo taken with a cowboy? For a fee. Be part of your own western shoot-out? For a fee. You can at least take a photo of a stagecoach for free. Parking is free. And you can window shop for free. And there is no shortage of shops. As far as we are concerned, we really spent much more time there than necessary. However, if you are traveling with children, and want them to have an chance to have some fun (although it will cost you), then a stop at Tombstone could be worthwhile. While in New Mexico, we chatted with a couple who were going to be on the road for six months. They have an RV and were headed from California to visit children along the east coast. They had just come through Arizona and we were discussing suggestions of what they should see in New Mexico and what we should stop and see in Arizona. 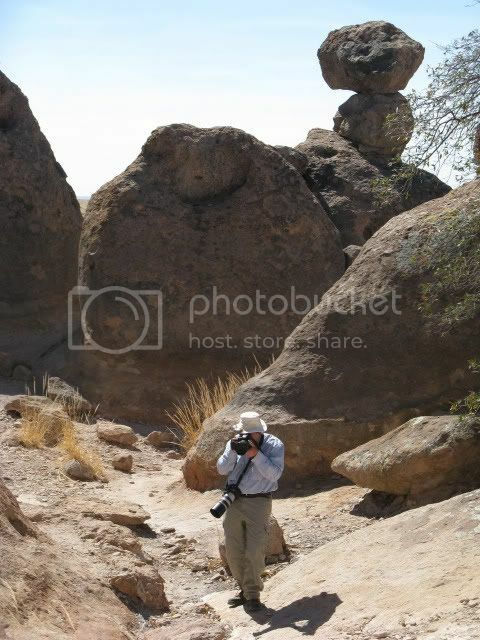 High on their list was the Chiricahua National Monument. They said it was not to be missed. A bit off the beaten path but well worth the drive. So off we headed from out original itinerary and we were glad we made the detour. 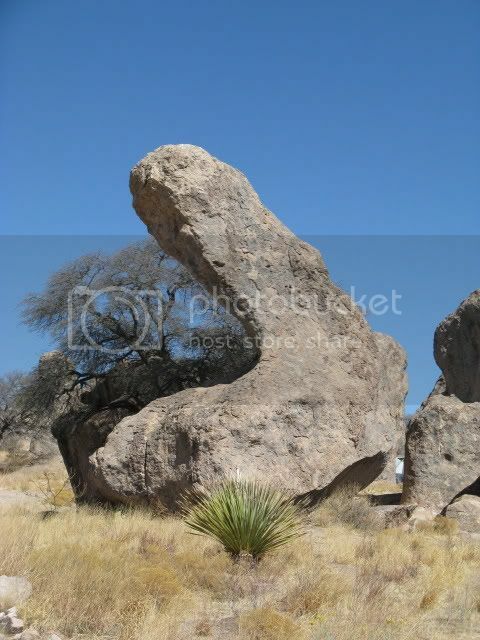 The area is beautiful with many unusual formations. It reminded us a bit of Bryce Canyon National Park but the colors and shapes were different enough to make this a unique experience. Just the type of unexpected things we love to find along the way. Summer is here! YES! Vacation time. Time to head to the beach or the mountain or take a cruise. But it also means that school is out. For parents, that means finding child care during the summer months. Not always an easy thing. The person has to be mature and trustworthy. So where to you start? One place to start looking is at a site like Sittercity.com. And what I find interesting about this site is that they provide not only sitters for children but also pet sitters and house sitters. So if you are going away on vacation, Sittercity.com can provide someone to look after your pet and check on your house. And be sure to take advantage of summer savings they are now offering ... hurry as it expires 7/31/11. We spent a night in Deming, NM. Nothing to really write about. It was nice to get on the road again the next day. Based upon people we talked to and things I read, we decided to stop at City of Rocks State Park. It turned out to be a pretty neat place with very interesting landscape formations. We then drove up to Silver City, thinking about taking a detour to the Gila Cliff Dwellings National Park but another fire meant another change of plans ... the road to the park was closed. On to Glenwood, NM where we stayed at the Whitewater Motel, a charming small comfortable place. The next day was the Catwalk and the ghost town Mogollan. The Catwalk was really neat. The history behind it is a pipeline for water that was laid hugging the side of a canyon wall. Now there is a marked trail that goes along the canyon. The first 1/2 mile of the trail is handicap friendly. While parts of it did have its ups and downs, it was an easy walk. The remainder of the trail was a tough dirt trail with significant ups and downs. After trying that for about 15 minutes, we had to turn back. Still, the canyon and waterfalls is beautiful and we are glad we stopped. Our next stop was worth it only for the drive. The ghost town of Mogollan is not, literally, a ghost town. It currently has thirteen residents with gift shops and old buildings only open 'in season' Friday through Sunday. The drive to the town, though, was something else ... steep, very curvy and very scenic. However, with all of the steep curvy roads we had been on and would be going on, it was an unnecessary detour. Continuing into Arizona on routes 78 and 191, we spent a night at Willcox, NM. As we continued west towards Las Cruces, we made a stop at the White Sands Missile Museum. It is on an active military base and we were required to show photo ID at the guard gate. There is no charge to visit the site. 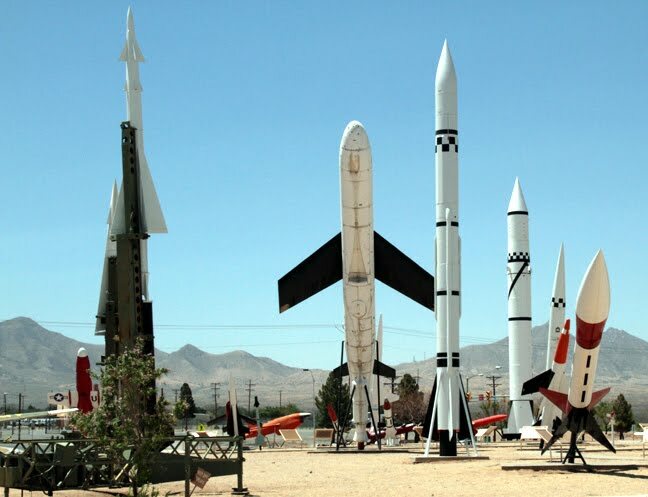 We found it quite interesting, with a display sign at each missile giving some history, such as when the missile was used, plus statistics like range and fuel type. There is also a small gift shop and indoor museum. Notice the mountains in the photo. My husband asked the guard about taking photographs. No problem as long as the camera was pointed towards the mountains and in no other direction. If you have an interest in military history, this is a worthwhile stop. Packed into the car for our trip, along with the fishing equipment, pillows for napping in the car, a box of literature (carefully organized by itinerary, of course) and folding chairs, was a cooler. We discovered a long time ago that being off the beaten path, the way we like to travel, we can get awfully hungry at a time when there are no restaurants around. It is those times that we pull things out of the cooler like deli meats or yogurt. How much easier it would have been to have everything in one place, in an easy to carry bag or basket. Not only that, for times we were off the road and hitting some of the hiking trails, a picnic backpack would have been perfect for us. There were some days we were out late to watch the sunset. I can just imagine the romantic picnic we could have had, perhaps with the bottle of wine I purchased at a winery we stopped at. For our next car trip I’m definitely going to have to rethink the dishes and utensil thing. Digging through a bunch of supermarket totes to find a knife or fork is not really fun. 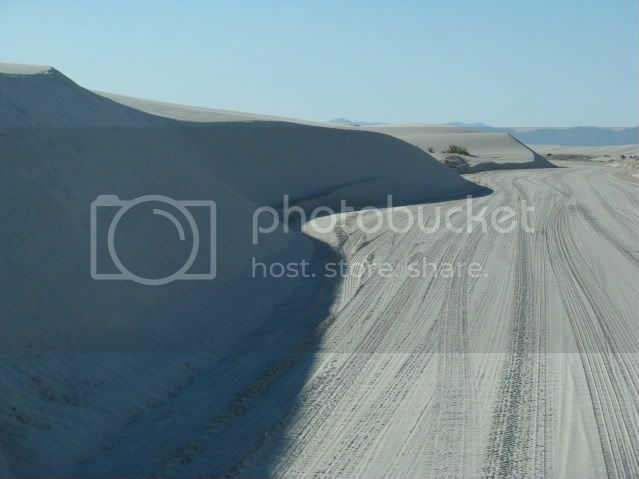 Plans were to go to White Sands National Monument in the late afternoon. There is an 8 mile drive with opportunities to stop and walk/climb on the sands. And then there is a ranger led Sunset Stroll. We arrived at the park around 4:30, stopped at the visitor's center, then started on our drive. We took advantage of the pull offs and climbed some of the dunes and walked along the tops and, of course, took loads of pictures. The sand (gypsum) is very fine. In spite of the heat of the day, it was cool to the touch. And unlike beach sand which clings, this sand simply brushes off. 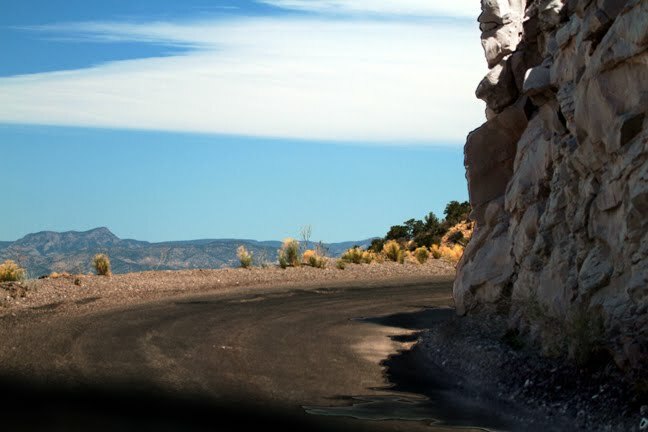 Part of the road is paved but most of it is hard gypsum. 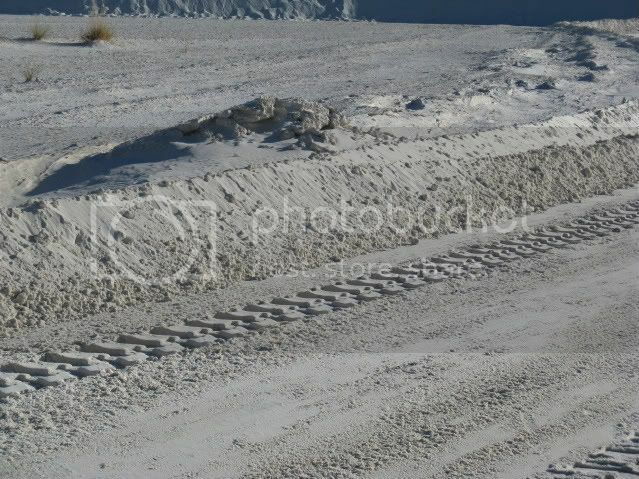 I looked at the edges of the road and said to my husband that they must plow this road ... the edges looked just like snow piled up along our roadsides in winter. Sure enough...in the windy season (ending about mid-May) they plow daily. At 6:30 p.m. we were at the spot for the 6:45 ranger led Sunset Stroll. We walked up over a dune, into a inter-dunal area and learned a lot about the flora and fauna living in the dunes. The walk took about one hour and was about 3/4 of a mile in length. We finished on top of a dune to watch the sunset. It was really neat. This was another one of those places not on the original itinerary but that we decided to go a bit out of our way and visit anyway. And we are glad we did. 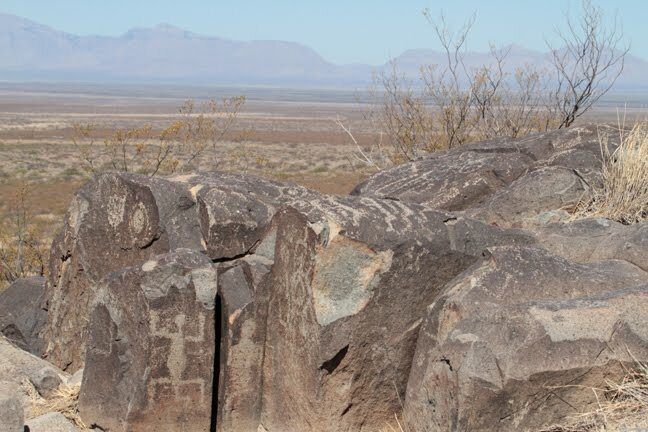 The Three Rivers Petroglyph Site is north of Alamagordo, NM and is easily reached by car. There is a trail that takes the visitor around some of the petroglyphs. The trail is not long but it goes up and down and is no where near anything like a groomed trail. We were glad we had our hiking shoes on and our walking sticks with us. 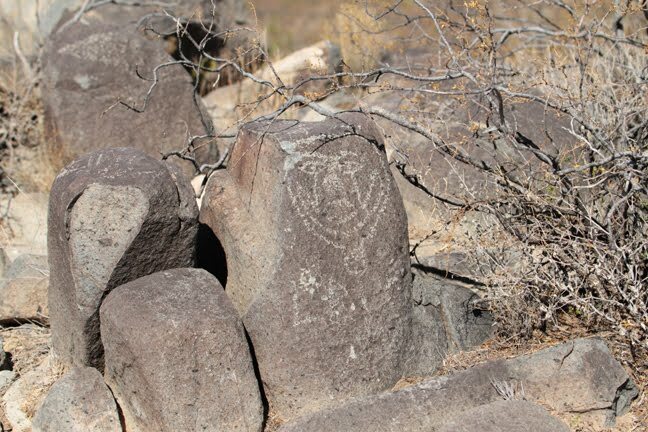 We've seen petroglyphs before but never so many in one place and so well preserved. Another interesting feature about this area is that a visitor can walk wherever they want. There is no requirement to stay on the trail. The site includes a very nice picnic area with sheltered tables, restrooms and a water fountain. It was an interesting place to spend a few hours. Cloudcroft, NM was the quiet sleepy town we had been looking for ... a place to spend two nights to rest and relax, after a series of one-night stands on the road. Plus, Cloudcroft is close to Sunspot, home of the National Solar Observatory, one of the places we planned to visit. After driving through the very small town, and then back again, we decided to stop at Spruce Cabins to check price and availability. Cabin 3 was available for two nights and I asked to see it. It was lovely ... a large room with a couch, queen bed and kitchen area with full sized refrigerator and stove. Topping it off were two Adirondack chairs out front. Perfect! Spruce Cabins offers an AAA discount that is 10% off the regular room rate. There is no housekeeping, as I suspected with a cabin, but towels will be replaced upon request. It was a delightful place to stay. Provided us just what we were looking for: some quiet and rest. As I mentioned in my previous post, we had to reroute. Our original plan was to go north through Carlsbad, then west at Artesia, spending the night at Cloudcroft, NM, continuing the next day to Ruidoso. While talking with the park ranger at the Guadalupe Mountains National Park, we learned that there was a fire at Mayhill, AZ and the road from Artesia to Cloudcroft was closed. Instead, we were directed to go north to Roswell and then swing west, and southwest, to approach Cloudcroft from a different direction. That route took us through Ruidoso, a stop on our itinerary where I hoped we would spend three nights while my husband got in some trout fishing. So we figured it wasn't too big a deal ... just reverse where we stayed first. On the way we took a short detour through Lincoln and Capitan, NM. 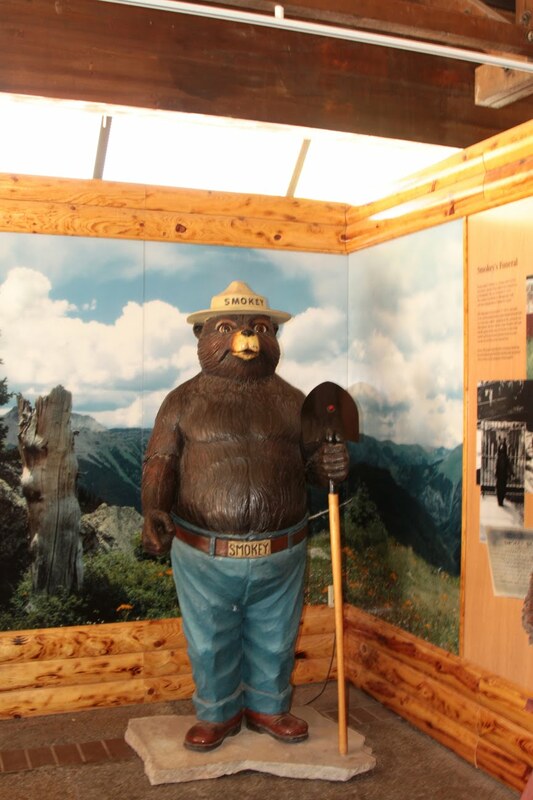 In Capitan we visited the Smokey Bear Historical Park. It was in this area that a cub was found after a forest fire, clinging to a tree, burned and dehydrated, weighing only 5 lbs. It was cared for and became the live symbol for Smokey the Bear. Smokey lived most of his life at the National Zoo in Washington, D.C. but when he died, he was brought back to Capitan and buried there. The historical park has a very nice boardwalk through a garden which displays the flora at various elevations in the Sacramento Mountains and, at the end of the walk, is Smokey's grave. Finally we arrive in Ruidoso and it was nothing like I thought it would be. I envisioned a sleepy little town in the mountains. Instead, it is quite artsy, with lots of galleries, gift shops and restaurants. And no mountain streams filled with trout. The area was in a severe drought situation and the streams were dry. Not being the quiet laid back town I expected, and with no chance to do any fishing, we decided to move on to Cloudcroft. Cloudcroft IS the sleepy little town Ruidoso was not. We stopped at Spruce Cabins and, after checking out an available cabin, booked it for two nights. We had a delightful relaxed time there but travel within the surrounding Lincoln National Forest was limited. Many roads into the forest were closed due to the extreme fire hazard. The observatory has an excellent display, explaining sun research, including several hands-on exhibits. 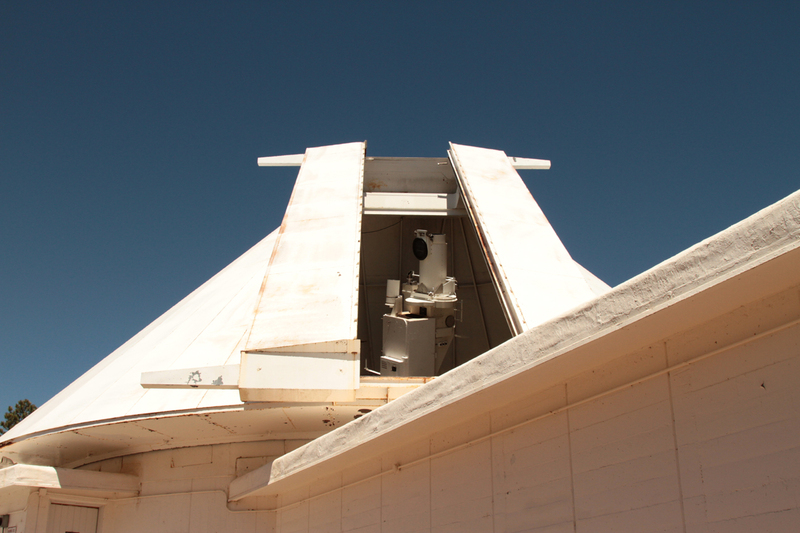 A short self-tour walk around the area brought us past 4 telescopes, with visitors allowed in two of the buildings to view the actual telescope. We were glad the walk was short as we were at 9200 feet and we were both feeling the altitude. We then returned to Cloudcroft, coasting down that narrow mountain road. We spent the rest of our day just relaxing and enjoying the Adirondack chairs outside our comfortable cabin. It was a great opportunity to recharge ourselves. On the agenda was Carlsbad Caverns National Park. When I looked carefully at the map, I saw that Guadalupe Mountains National Park was just south of the Caverns. So of course we had to go there also. The Guadalupe Mountains are beautiful, a former submerged reef now rising out of the ground. It was very hot (97 degrees) and very windy (with gusts to 50 mph). We learned that nearby was a stop on the Butterfield Overland Express, a cross country mail route that ran for about a year. A short walk took us to the only original Butterfield building that is remaining and also near a major highway. 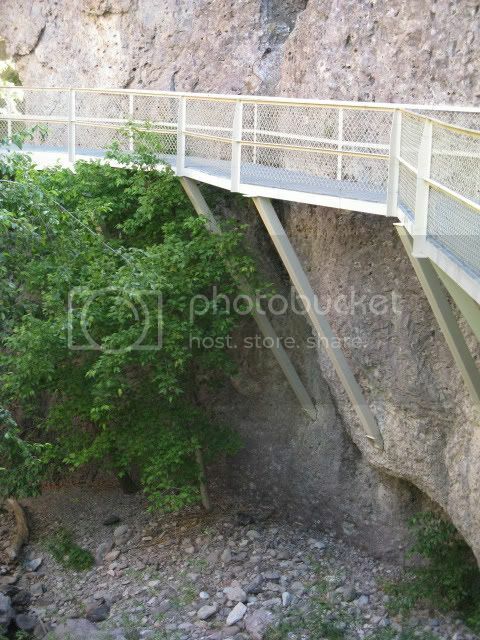 After our visit to this park, we headed towards Carlsbad Caverns National Park. Construction on the road slowed our travel in both directions so we arrived at Whites City a bit later than we anticipated. Whites City is just outside the entrance to the caverns and we looked for a restaurant (there is one) and it was closed, like everything else in the very small town. A narrow, windy road took us up to the visitor's center. We learned that, Yes, the bats were back and the ranger led program would start at 6:30 p.m. It was now about 3, we were hungry, we were tired. We had a small bite to eat at the restaurant there, browsed through the gift shop and displays, and then decided to move on. For one, I didn't want to drive the narrow road down the mountain as it was getting dark. And second, our original route had been changed because of forest fires in the area and to continue on our planned itinerary meant driving the long way around. 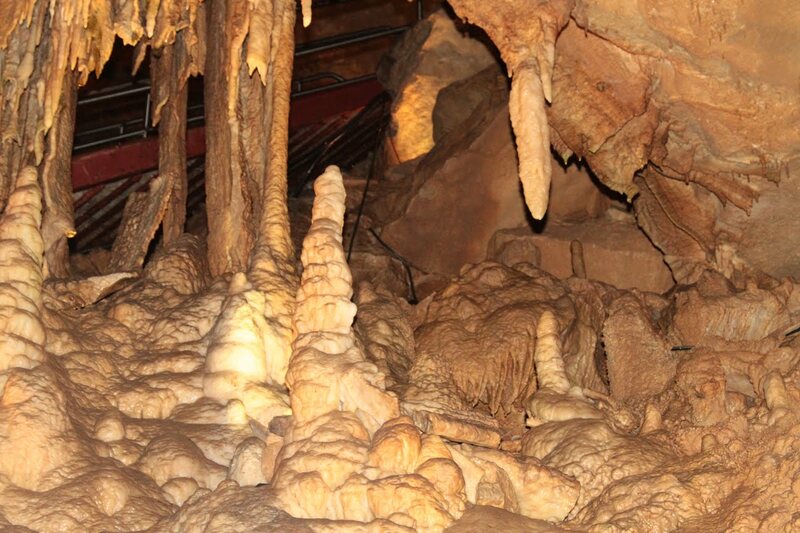 We had visited caverns at Mammoth Caves National Park and decided that one set of caves was enough for us. We saw signs for fried pies as we were traveling along I20 in Texas. We managed to sample one in Weatherford. While I understand it is in general a southern tradition, it is very popular in the Texas panhandle where it is advertised as being a specialty of the Arbuckle area of Oklahoma. My husband and I shared an apple fried pie and found it delicious. As we left Weatherford, we again decided to try and find another of the wildlife areas advertised in the literature we had picked up at the Texas welcome center. We found this one a lot easier than the last one but this one, too, had a padlocked gate across the road. I was very annoyed and will definitely be writing to the contact information on the brochure. Onward. Westward. I20 through Abilene, to Big Springs, where we turned north west aiming for Hobbs, NM. 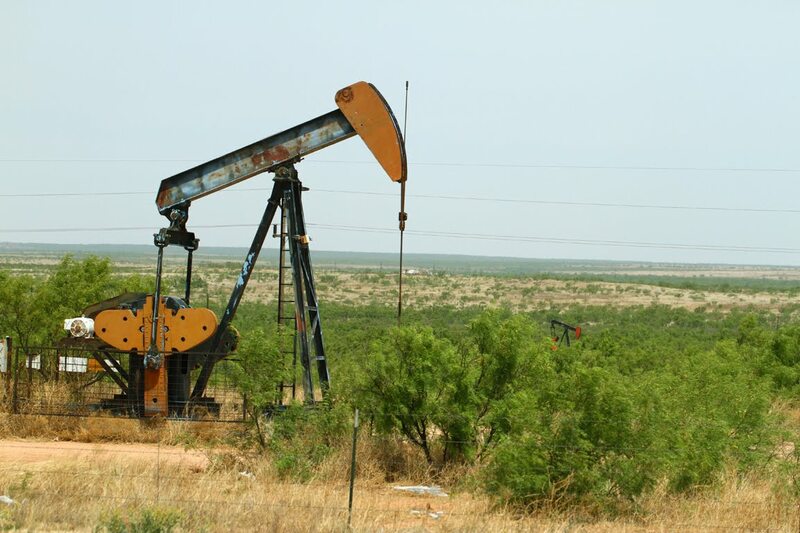 The area we drove through was definitely along the lines of what my husband pictured Texas would look like ... wide open, dusty, oil wells. Hobbs, NM, of course, is along the same lines. Town is very spread out, lots of wind, lots of dust. We decided to check in and settle in, eating dinner out of the cooler tonight. We chose this motel because of price, it had a guest laundry and its proximity to the battlefield, which is literally right next door. Wish I could do a do-over because this place isn’t worth any price. The best thing that can be said for the room is that it is large. And that is where the pluses end. The shower did not work properly. A dribble of hot water came out of the bath tap and then the handle spun freely. Because of the lack of water pressure, we could not get the shower to work unless we wanted to increase the cold water and take a cold shower. A bedside lamp and a tabletop lamp did not work. There was an old candy wrapper under the bed. And I have never seen such thread-worn blankets in my entire life. There was a Hampton Inn across the street. Wish we had stayed there. 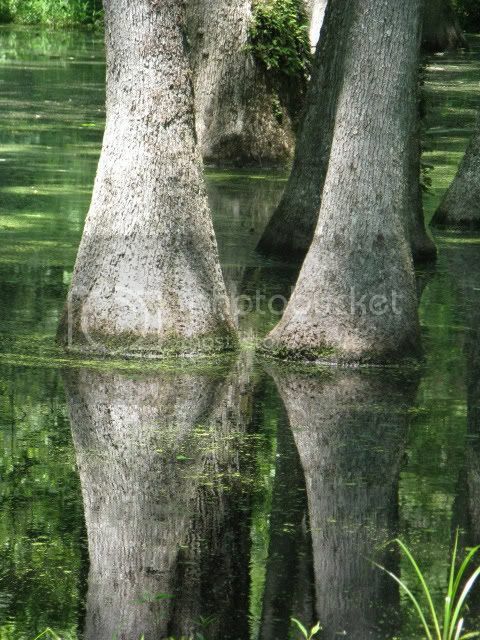 The Natchez Trace Parkway is loaded with history. It was originally an Indian trail, traveling through the Chickasaw and Choctaw Indian nations. It was used as a path home from Natchez where traders would sell their goods after sailing down the Mississippi. With no way to sail back up the river, they would also sell their boats for lumber and then hike home on the trail. Once the steam engine was invented, and the traders could travel back up the river by boat, the trail fell into disuse. I have one word for driving on the Trace. Boring! Driving the Trace is driving through a dense tunnel of trees. 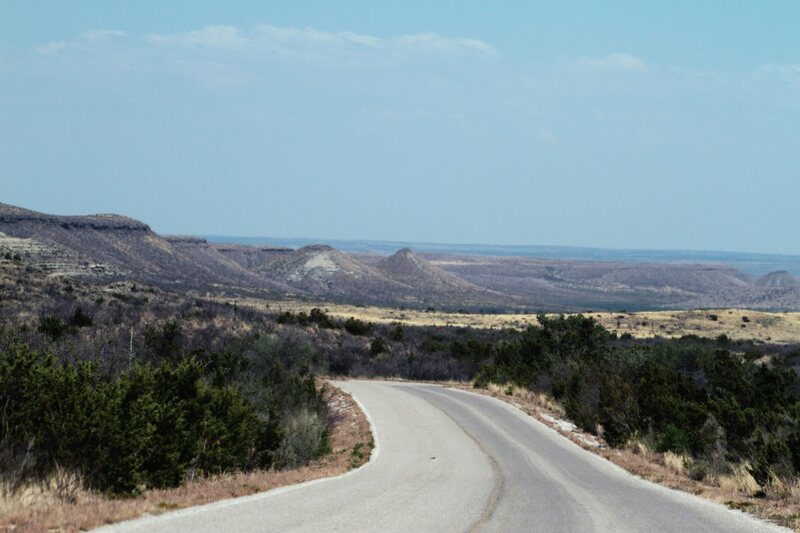 There are no vistas, no interesting buildings along the way, very little wildlife. I originally thought it would be kind of neat driving this road, stopping for some of the short hikes into what I had hoped would be interesting areas. But the area through Tennessee was a total bore. After Tennessee the Trace clips a corner of Alabama and then we were into northeast Mississippi. I had planned for us to spend a night at Tishimongo State Park and we kept to that. The park has six cabins that are complete with linens and kitchenware. Plus the park has a lake and a stream and I figured my husband might be able to fish. That part of the plan turned out well. The cabin was heated and comfortable and we both had a great night’s sleep. And while the river was too swollen to fish, my husband found a great place on the shore of the lake and fished both that evening and the next morning. And he can verify that there IS fish in the lake. Next morning we went into the town of Tishimongo for breakfast, stopping at Inez where for $10.50 we both had coffee, eggs, meat, biscuit, hash browns, an apple pie for my husband and a corn muffin for me. We sat next to a very nice couple who gave us some sightseeing advice. Since the wife thought the same about the Trace as we did (“All you see are trees!”) we decided to make some changes. We continued on the Trace into Tupelo where we paid a visit to Elvis’ birthplace. Then we were off the Trace, heading south on route 45, into Columbus, MS where we spent the night and walked around this neat little town. We even tripped over an art gallery showing and saw some very interesting work. We finished our evening with dinner at Huck’s Place, both of us enjoying our meals. Next morning, heading due west, we rejoined the Trace where it is crossed by route 82, as there did seem to be some interesting possibilities between there and Jackson, our southernmost destination on the Trace. 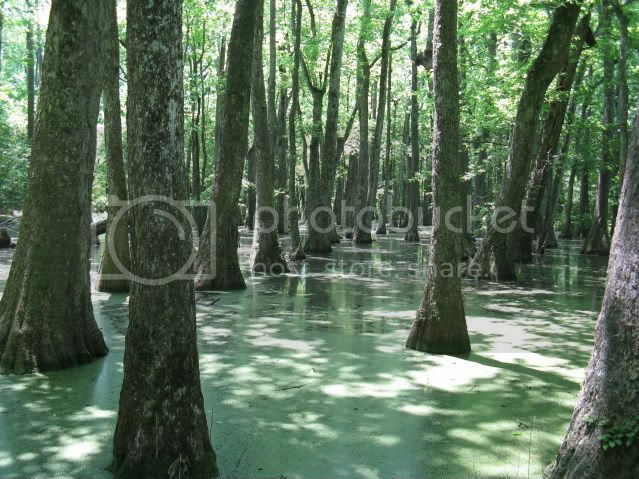 We stopped at Cypress Swamp for a nice stroll on the path that went around a swampy area. And as the Trace approached Jackson, it bordered a reservoir, which provided some nice scenery. Perhaps if we had gotten off the Trace and stopped at more of the little towns along the way and studied the history a bit more it might have been more interesting. But as “drives” go … if your main interest is scenery and wildlife, as ours is, find another route. As we approached Nashville we needed to make a decision where to stay. The start of the Natchez Trace is to the southwest of Nashville but we decided to check out the Grand Ole Opry area, on the east side of the city. After all, when in Nashville …. My husband is not a big fan of country western music and the last thing he would have thought about doing in Nashville was going to the Grand Ole Opry. I like some country western, having learned to line dance with my daughter. At the hotel desk they had information on that night’s concert and I actually recognized a name or two. Even my husband did … the Charlie Daniel’s Band. So on a whim we went and bought tickets for the concert. And we lucked into dead center row F tickets. We learned a lot that evening. For one, we didn’t have a clue that the performances were live radio shows, including commercials. And the lineup that night was top talent, as shown by the reactions of the audience. And why? It was the one year anniversary of the May 3, 2010 flood that had left 4 feet of water in the concert hall. Before the show began, there was a short movie showing how the hall looked, and the work that was done to repair and restore it. The performers that night were there to celebrate the anniversary and the show was super. We loved the fiddle playing and thoroughly enjoyed watching Charlie Daniel playing his. We both really enjoyed the show and were glad we went. I have claustrophobia so have never visited a cave. After reading how large the passageways and rooms are in areas of the caves on public tours at Mammoth National Park, I decided to give it a try. And not only did we take one tour but we actually took two. The first tour is called the Mammoth Cave tour ($5.00 per person). 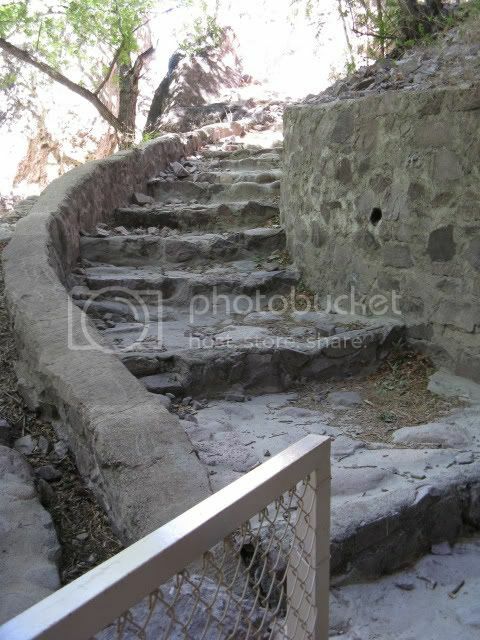 It starts at the original historic entrance which is reached by climbing down (and then back up) 160 steps. The tour lasts about 1-1/4 hours. Total walking distance is about one mile. We learned a lot and we enjoyed the tour. After the tour, we had to walk over an approximately 4-foot rubber pathway in a trough filled with Lysol. There is a problem with white-nose syndrome, lethal to the bats, and the idea is to try and keep this fungus from spreading. We spent the night at the Mammoth Caves Hotel. It is literally attached to the park’s visitor’s center by an open bridge. The hotel is old. The room is small, it was difficult controlling the room temperature and there is no wi-fi. Not only that but I had a problem trying to connect my Verizon modem because we were in a 'roaming' area. They have a dining room and a coffee shop. The dining room is known for their Kentucky fried chicken and the time of the year we were there (May) it has to be pre-ordered since it can take up to 45 minutes to prepare. We ordered ours and then went on our tour. It was ready for us and we both enjoyed our dinners. I’m sure the hotel would be a very pleasant place to spend an extra day or two but we had horrific rain. And being holed up in a tiny hotel room wasn’t the way we wanted to spend our day. So we decided to do our second tour and then get back on the road. Our second tour started at 8:45 a.m. and is called Frozen Niagara ($10 per person) because of the formations. We had an approximately 10 minute bus ride and were taken to a man-made entrance to the tunnel. Heads up warning! If you've got a problem with insects and/or rodents, skip this tour. This cave area is loaded with cave crickets and they are, literally, all over the place. It is also the home to several pack rats, which we did see back in their nest, and they are actually pretty cute. This tour was well worth the money. Whereas the first tour took us through large passageways into large open rooms, this cave was filled with beautiful formations. It is a short walk of only about 1/4-mile but took about 1 1/2 hrs because there is so much to see. We saw columns and drapes and 'cave bacon'. And of course the area that looks like a frozen waterfall. Nice tour. 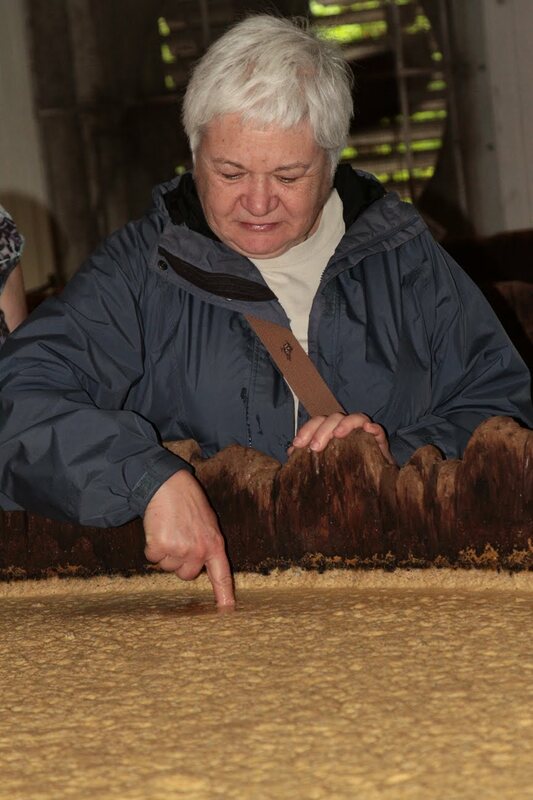 We visited two whisky bourbon distilleries on our trip: Historic Tom Moore Distillery and Maker’s Mark Distillery. Want to know what makes a whiskey a bourbon? The mash must be at least 51% corn. Learn something new every day. The Historic Tom Moore Distillery advertises itself as the only full distillery tour in Bardstown. But it was a disappointment as we learned they do not ferment in the summer time. It was a short tour but they did give us a generous tasting of two bourbons. We decided to swing by a second distillery and I’m glad we did. Given on the half-hour in the spring, summer and fall, the Maker’s Mark Distillery tour was excellent. It lasted about an hour and, unlike the previous distillery, they ferment all year long. Not only that, but they ferment for three days in open vats and we were allowed to put our fingers in the one-day old vat, the two-day and the three-day to taste the difference in the fermentation. The bottling area was in full operation. They are a small distillery and have just one line. Their ‘signature’ is the hot red wax that the top’s of the bottles are hand-dipped in and then the wax is allowed to run down the bottle before it is then put in boxes to be shipped. Our samples were waiting for us in the tasting room and they were not as generous as that served in the Tom Moore distillery but it was enough. (And both my husband and I liked the Maker’s Mark bourbon better.) And then the bourbon samples were topped off by a piece of chocolate bourbon candy, which was excellent. A unique feature of buying Maker’s Mark bourbon at their factor store is that you can dip your own bottle in the signature red wax. Several people did that and I can see where it makes a neat souvenir. We didn’t buy anything but I did price several items. And just as an FYI, I did find one item cheaper elsewhere. We’ve been on the road for only two days but it seems like we have been gone forever. My guess it has to do with the weather for one, and being totally exhausted for two. We knew we’d have to watch the weather. We were headed southwest out of Louisville, into an area that had been deluged with rain and some awful tornadoes. Yesterday we woke up to heavy rain but by the time we ate breakfast, it has eased off. Fortunately, after that, we only hit clouds and light rain. We were really worried as we could see, off to the west, a bank of heavy dark clouds and we were concerned about when that weather would hit us. And it hit us Monday afternoon, just before we were ready to start our cave tour at Mammoth Cave National Park. Fortunately we had our Gortex jackets and both of us were wearing hiking shoes with wool socks. Our pants got soaked. Our shoes got soaked. But my wool socks managed to keep my feel warm (which wool does even when wet). So we weren’t terribly uncomfortable but after the tour we were glad to get into our room and take hot showers. As for being tired, we both had slept poorly the night before in Cincinnati. Drove into Kentucky, deciding to bypass Louisville and the slugger factory. Instead we drove into Bardstown, Kentucky and visited the Historic Tom Moore Distillery which turned out to be a bit of a disappointment as they, like many distilleries, stop fermenting in the summer time (which, of course, we didn’t know). We knew we wanted to be at Mammoth Caves National Park by 4:30 for a tour but we had time and decided to visit another distillery, Maker’s Mark Distillery. And we are glad we did. This distillery is in full operation and it was an excellent tour. We really enjoyed it. But now we had only about 1.5 hours to make it about 80 miles on country road to the park. So I put the pedal to the metal and we make it with 20 minutes to spare. Super. Enough time to get the tickets, go the bathroom and ready ourselves for the tour. Only to find out that the park is on Central time and we had an HOUR and 20 minutes! What a joke on us. We could have moseyed through the countryside and taken our time. Oh well…gave me time to shop at the park stores (didn’t buy anything) and check in at our hotel which was right next door to the visitor’s center. Our planned first night on the road was Cincinnati and we made that. Our second planned night was supposed to be Nashville, TN but that changed really fast as we closely studied the possibilities open to us south of Louisville, KY. The original schedule was the Louisville Slugger Factory, the Bardstown, KY area to visit a whiskey distillery, Abraham Lincoln's birthplace which is a national historic park, Mammoth Cave National Park and, finally, Nashville for the night. But while in the hotel in Cincinnati, I did some additional research on Mammoth Caves and it looked like we'd have a problem with the timing of the two tours we wanted. We decided to take the Mammoth Passage tour and the Frozen Niagara Tour. The Mammoth Passage tour is offered only at 4:30 p.m. and we figured we'd have no problem making that tour, even with all we planned for the day. But that meant driving to Nashville in the evening and we nixed that. So we decided to stay at the Mammoth Caves Hotel for the night, making it possible for us to take the Frozen Niagara Tour at 8:45 the next morning, before continuing on our way through Nashville. And it's also a good thing I reviewed current information on the places we planned to stop. The Louisville Slugger Factory had new routing information on its website because of local flooding. In addition, we needed to stay on top of the weather forecast. The area we would be traveling through had been hit by tornadoes over the past week that caused many fatalities and much property damage. We needed to be prepared to change our travel plans based on almost minute to minute weather events. Our road trip started May 1 so you might be wondering why the posts aren't showing up until now. As my policy, I never write about a trip before we leave or while we are gone from the house. Just my own personal thing about not advertising to the world that our house will be empty. Anyway, we left western NY around 8:30 that morning and, driving through some rain and lots of clouds, we made it to Cincinnati, OH for the night. It was a bit over 500 miles but our car is extremely comfortable and we had no problem doing the mileage. Our itinerary eventually took us down the Natchez Trace to Jackson, MS, then turned west through Vicksburg, MS, across Texas through Dallas/Fort Worth, into southern New Mexico, then southern Arizona to Tucson. From there we turned north through Phoenix, to the Grand Canyon and then east to Monument Valley and the San Juan Mountains of southwest Colorado. South into northern New Mexico to visit Sante Fe and Taos before we headed to the Philadelphia, PA area to visit with our grandchildren. Hope you enjoy coming along for the ride and reading my posts. In Japan, don't give the impression that you are an alcoholic by filling your own glass. Instead, fill the glass of the person who is sitting next to you and then they will reciprocate. Be prepared to buy the next bottle of wine in Armenia if someone pours the last of a bottle into your glass. In Australia, you could be expected to buy a round of drinks. 'Shouting' is a custom where people, upon entering a bar, shout drinks to a group and pay for their round. When in Russia, use your vodka for toasting and don't drink it until a toast is made. Men down the shots in a gulp which women often sip it. And never, never mix your vodka or dilute it with water. If you drain a bottle, place the empty on the floor, not the table. Eating noodles in Japan? Be sure to slurp them. Not only is this OK but it is expected. When eating rice in Asia, never put your chopsticks into a bowl of rice in an upright vertical position. This is the way rice is offered to the dead and also imitates the way incense sticks for the dead are burned. Also, don't pass food directly from your chopsticks to another pair of chopsticks. If you want to pass food, place it on the person's plate. Passing from chopsticks to chopsticks is a Buddhist funeral custom where the cremated remains are passed from family member to family member. Tough for Americans but in Russia, better table manners are displayed by keeping your knife in your right hand and your fork in your left hand. Also, rest your wrists on the table edge. Show good manners in Nepal by waiting to be served and, if eating at a private home, ask for seconds. When eating with a group, no one leaves the table until the entire group has finished eating. If you must leave the table early, apologize and instruct those at the table to 'please, eat slowly'. You'll be insulting the cook in Portugal if you ask for salt and pepper or any other type of condiment that is not already on the table or served with the food. When dining with other people in France, discuss the meal's financial arrangement before going into the restaurant. Talking about the bill over dinner and/or splitting the check is considered extremely unsophisticated. Be prepared to share your meal from a single dish when eating in Ethiopia. Also, don't expect to be handed any cutlery. And meat dishes are usually eaten last. So don't head for the meat first and don't eat quickly which can be interpreted as greed. Common body language in the United States could mean trouble overseas. For instance, if you step over a person's legs in Nepal, you will be committing a big social no-no. In most parts of Asia, the foot is more than the physical lowest part of the body. It is considered the 'lowest' part in a social sense also. Don't touch anyone's body with your foot. Don't prop your feet on top of tables or chairs and don't point to people or objects using your feet. Just as the feet are the 'lowest' part of the body, the head is considered the 'highest' part. Don't touch a person's head in Asia and don't ruffle anyone's hair, including children. Also, one should never sit on a pillow that is meant to be used as a headrest. In the country of Fiji, shaking hands throughout a conversation is very common. At minimum, a handshake can last a long time. Heading back to Nepal, be sure to move your outstretched legs in so you do not, inadvertently, force someone to step over your legs. Also, give a wide berth to any monk's cushions when visiting a temple. And when walking around stupas or chortens, always walk in a clockwise direction. Although it might seem contradictory, in Japan always wash before entering the water in a Japanese bath. Use a wash cloth to cover your private parts. Getting on a Japanese train requires a lot of pushing and shoving. Expect it and do it yourself. Italian body language is very demonstrative. It is common for acquaintances to greet each other by kissing both cheeks. Hugs are common between men who are good friends, in addition to long lasting handshakes. Both Italian men and Italian women might walk side by side with their arms linked. Like getting on a Japanese train, pushing in crowded places in Italy is not considered rude. Do not be offended and do your best to hold your ground. When in Russia, be careful of thresholds. Many people feel it is unlucky to shake hands across a threshold. If you approached by someone in India who has their tongue between their teeth and motions with their hands like they are gathering the around around your head into their own space, do not be offended. On the contrary, this is a high compliment as the person is indicating that they find you incredibly beautiful or highly intelligent. Ordering two beers in the U.K.? Don't do it like you do in the U.S. with your index and middle fingers up and palm facing towards you. This motion is highly insulting. Instead, turn your palm outward, like giving a peace sign. After shaking hands in Morocco, touch your heart to show that you are taking the meeting seriously. Good friends greet each other with air kisses and a long stream of good wishes. 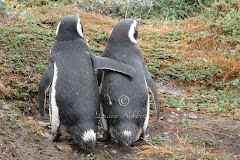 If you are thinking about going to South America on your own, check out South America Explorers first. Membership is not expensive and there are lots of benefits including tour planning and discounts at hotels and restaurants. Google (or Yahoo!) the Internet for coupons in cities you will be going to. For instance, Google "Chicago coupons" to turn up two-for-one and restaurant and shopping coupons. Check out eBay for coupons and discounts that others can't use. Type in the destination, such as a city or sightseeing destination (SeaWorld, Disney, etc) and "coupon" and then repeat the search with "gift certificate" instead of "coupon".